The Brooklyn Arts Exchange Announces The Dani Nikas Opportunity Fund Providing 100K Annual Scholarship Support to the Brooklyn and New York City Arts Community in 2016! The Brooklyn Arts Exchange - http://www.BAX.org - Announces The Dani Nikas Opportunity Fund Providing 100K Annual Scholarship Support to the Brooklyn and New York City Arts Community in 2016! We need to raise a generation of people who are unafraid to question, to think, and to create boldly. 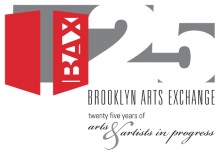 Brooklyn Arts Exchange (BAX) http://www.BAX.org Celebrates 25 years with the launch of a new initiative: The Dani Nikas Opportunity Fund to double the annual scholarship support to the Brooklyn and New York City arts community in 2016! In 1991 Marya Warshaw started BAX with a dream that there could be a space in Brooklyn that would be a haven for artists at all stages in their development. Ms. Warshaw’s belief is that no matter at what moment in one’s creative life, from a three-year-old taking their first dance class, to a seasoned veteran of the performing arts, all are inspired by gathering in one space. Entering into 2016, BAX, a space that began with a dream is now celebrating 25 years! BAX is an arts center where students can learn from some of the most accomplished working theater and dance artists in New York. BAX is development incubator and performance venue for professional dance, theater, and performance artists who need the space to try and fail and try again as they develop risky and daring work and ask the difficult questions. A place for discussion about the things that impact our daily lives as artists and people, BAX helps define the brilliance of brilliant artists who aren’t so easily defined because they are ground breakers just as BAX is a ground breaking organization. BAX envisions the needs and offers support to these artists before the artists themselves even realize what kind of support their work needs. Dani Athena Nikas was born in Long Beach CA and grew up there and in NJ/ She received her MFA in Dance from SLC. Her work was presented in NYC at DIA Center for the Arts, the Ohio Theater, NYU, Movement research and BAX among others. She was in residence at The yard in Martha's Vineyard in 1996/1996. Dani formed her own company in 1990. Nikas taught for over 20 years including at BAX, NYC public schools and Te Dalton School. She was the Director of BAX's Young People's performing Workshop (now called Dance Performing Workshop). Before Dani Nikas passed in 2001 after a long battle with cancer, she instilled the values of generosity, artistic excellence and creative risk that BAX still holds dear on to thousands of students. In her name, the Dani Nikas Fund launched January 1, 2016 has already raised just over thirty five thousand dollars ($35,000) toward its hundred thousand dollar ($100,000) goal to continue her legacy in providing scholarship support to the city’s arts community. “We need to raise a generation of people who are unafraid to question, to think, and to create boldly…citizens of the world who aren’t afraid to ask tough questions about race, class, gender, identity, justice, and the status quo. And we need them to do so with understanding, with complexity, with openness, and with love. That is what drives us all at BAX”, Marya Warshaw, Founder and Executive Director, BAX. Most recently, February 16, 2016, it was announced that BAX received funding from prestigious The Doris Duke Charitable http://www.ddcf.org Foundation for additional programming initiatives. For more information visit http://www.BAX.org and/or publicist Fran Kirmser fran(at)frankirmser(dot)com 212 554 3431.